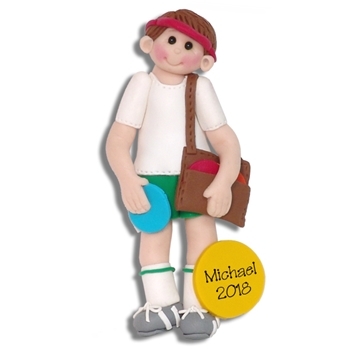 This disc golf personalized ornament is is part of my "Giggle Gang Collection" He is also part of my new limited edition collection which is designed and handmade by me from polymer clay. There are only 2 available. Comes complete with a hook and satin ribbon for hanging. "All polymer clay ornaments are hand made and may vary from the photograph. I volunteer and work with the SPCA. I currently have 7 rescued cats and one rescued dog. Needless to say my house is full of cat and dog hair so it is almost impossible to keep it out of the clay so there may be an occasional cat hair or dust particle in the clay. I consider this to be part of what gives my work character." Personalization is also hand done. Personalization in photo is computer generated.